If you’re intimidated by the prospect of making a souffle, then this recipe is a special gift for you. This double-baking method (oven time separated by hours, if convenient) is great for entertaining: no more guessing about when’s the correct time to put the souffle in the oven; no more anticipating when the guests will be ready to eat the puffed-up, gorgeous masterpiece. Plus, I’ve always felt that individual servings (in this case individual souffles) makes each guest feel special. 😉 The recipe comes from Secrets of Success, one of my favorite cookbooks. Heat the oven to 425F. 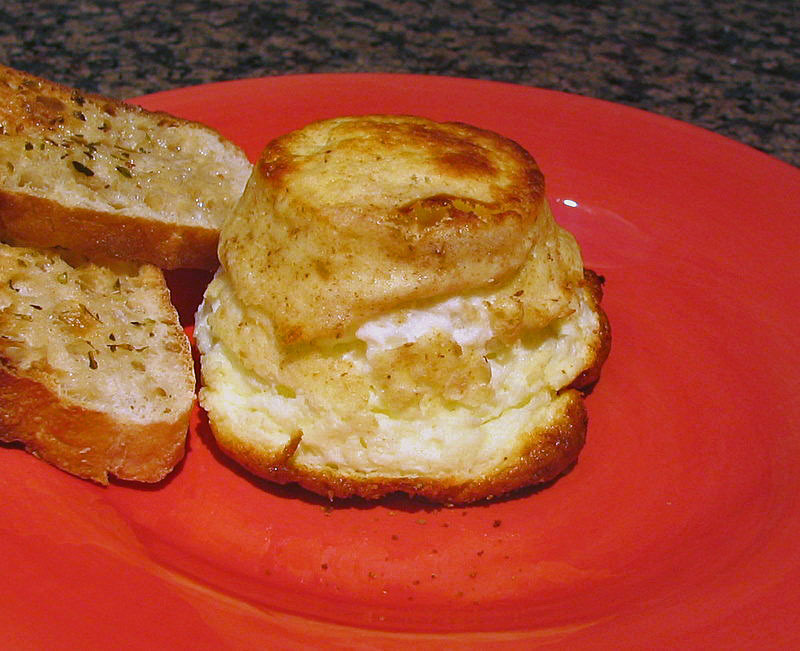 Butter 8 ramekins (5 ounce size), and coat them with bread crumbs. Reserve remaining bread crumbs. Melt the butter in a saute pan, add the flour and cook, stirring, for 20 seconds. Whisk in the milk, cook stirring until slightly thickened, 1 to 2 minutes. Crumble 8 ounces of the goat cheese in a large bowl (you will have 2 ounces left), add the hot milk/flour mixture, stir to combine. Add the egg yolks one at a time, mix well, and season with salt and pepper. Beat the egg whites by hand or with an electric mixer until stiff peaks form. Delicately mix half the egg whites into the cheese mixture to lighten it a little. Then, fold the rest of the egg whites. Fill the ramekins halfway with the mixture, crumble a little goat cheese on top, and fill the ramekins to the top with the remainder of the souffle mixture. Sprinkle the top with bread crumbs. Place the ramekins in a large baking dish, and fill it halfway up the sides of the ramekins with very hot (or boiling) water. Bake on the center of the oven until golden, about 25 minutes. Remove from the oven, let it sit in the water for about 15 minutes, then carefully unmold them, by running a knife around the edges and inverting the ramekins over a plate. Transfer them to a baking dish. They can be held at room temperature for up to 6 hours. When you are ready to serve them, bake at 425F until golden brown, 5 to 7 minutes. Comments: I’ve used this recipe many times in the past few years, sometimes with feta cheese instead of goat cheese, but always with the same delicious outcome. It is important to coat the ramekins well with butter, so that they easily un-mold. One or two of pieces of bruschetta on the side completes the perfect opening for a special dinner. The recipe comes from Zax, a now (unfortunately) defunct restaurant in Berkeley. You can find old reviews online praising this dish, and once you try it, you’ll praise it too! Note to self: try this method with other flavors. According to Bauer, the key to making a twice-baked souffle is the use of cake flour: it gives the final product a more refined texture. receita em portugues na proxima pagina…..
Unte 8 tigelinhas (de cerca de 3/4 de xicara de tamanho) com manteiga e cubra ligeiramente com farinha de rosca. Reserve o restante da farinha. Derreta a manteiga numa panela, adicione a farinha de bolo e cozinhe, mexendo, por 20 segundos. Adicione o leite, cozinhe mexendo até engrossar, 1 a 2 minutos. Esmigalhe cerca de 3/4 do queijo de cabra em uma tigela grande, adicione o molho branco feito anteriormente e misture bem. Acrescente as gemas, uma de cada vez, misture bem e tempere com sal e pimenta. Bata as claras à mão ou com uma batedeira até formar picos firmes. Delicadamente misture metade das claras na mistura de queijo. Em seguida, adicione o restante das claras, incorporando sem deixar que perca o volume. Encha metade das tigelinhas com a mistura, coloque um pouco de queijo de cabra em cima, e preencha até o topo com o restante da mistura de suflê. Polvilhe o topo com farinha de rosca. Coloque as tigelinhas em uma assadeira grande, e despeje agua fervendo (ou bem quente) ate’ a metade da altura dos recipientes. Asse no centro do forno até dourar, aproximadamente 25 minutos. Retire do forno, aguarde 15 minutos e desenforme cuidadosamente, passando uma faca nas bordas e invertendo as tigelinhas sobre um prato. Transfira-os para uma assadeira. Eles podem ser mantidos em temperatura ambiente por até 6 horas. Quando você está pronto para servir, assar em um forno bem quente até dourar, 5-7 minutos. I’ll definitely try this recipe with feta. I’ve never made a soufflé before so I’m a little nervous. But it looks awesome! This looks amazing but I have a question with regard to the cheese. Since feta can be substituted, I assume this requires a soft goat cheese? It’s been my experience (as someone raised on raw goat milk) that there are certain goat cheeses which have that really goat-y taste and I see nothing in the recipe that would smooth out that flavor so I’m wondering which brand of goat cheese you use. And is there really no discernible difference between the feta and goat cheese? I did not taste the souffles side by side and it’s been a while since I made the one with feta, but I remember it was quite “sharp” tasting, and it did not melt as well as the goat cheese does. Sally, amei a idéia! Confesso que sou meio pé atrás com suflés…! E também adoro queijo de cabra ou Feta! Hummmmm! Fico imaginando com um Gruyére ou Ementhal! Ai, que delícia!Combina com o frio que está fazendo por aqui! Achei que seria bom publicar agora, pensando mesmo na turma do patropi e Australia que estao curtindo um friozinho bem apropriado para esse tipo de receita. Beautiful, Sally! So impressed that you unmoulded them and they didn’t collapse! I admire you for the fact of baking souffle twice! This is a lot of work. Congratulations!